Designers always get good inspirations from fascinating geometric structures gifted by the nature. In the recent years, various computational design tools have been proposed to help generate cell packing structures on freeform surfaces, which consist of a packing of simple primitives, such as polygons, spheres, etc. In this work, we aim at computationally generating novel ellipsoid packing structures on freeform surfaces. We formulate the problem as a generalization of sphere packing structures in the sense that anisotropic ellipsoids are used instead of isotropic spheres to pack a given surface. This is done by defining an anisotropic metric based on local surface anisotropy encoded by principal curvatures and the corresponding directions. We propose an optimization framework that can optimize the shapes of individual ellipsoids and the spatial relation between neighboring ellipsoids to form a quality packing structure. A tailored anisotropic remeshing method is also employed to better initialize the optimization and ensure the quality of the result. 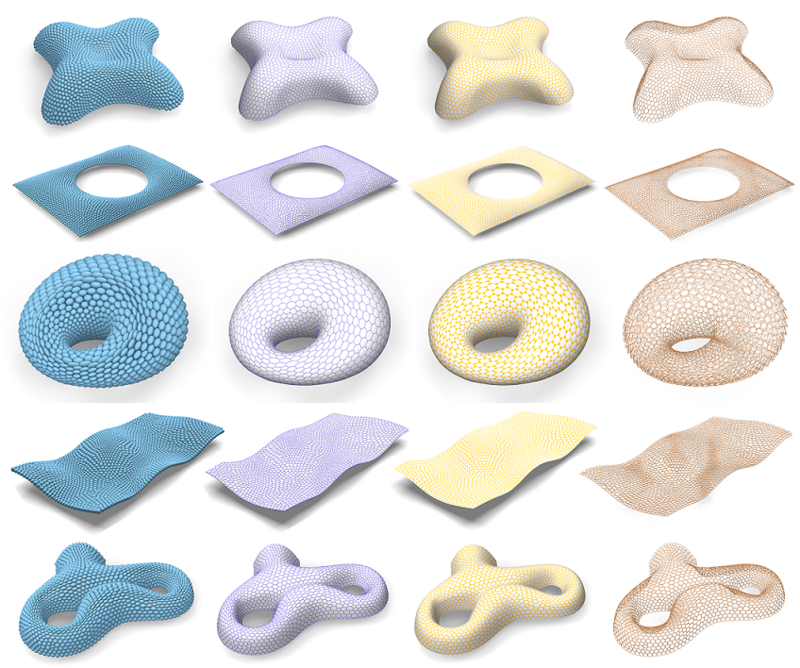 Our framework is extensively evaluated by optimizing ellipsoid packing and generating appealing geometric structures on a variety of freeform surfaces. We present an optimization-based framework that can generate plausible ellipsoid packing structures on freeform surfaces. The optimization is initialized by anisotropic remeshing of the underlying surface (left). The ellipsoids are densely packed on the surface and coincide with local surface features (middle). Other appealing structures can be easily derived from the ellipsoid packing structure, including hexagon-dominant mesh, hybrid mesh, and ellipse packing structure (right). we develop an optimization framework for generating ellipsoid packing structures on freeform surfaces. We define an anisotropic metric on the surface which is adaptive to local surface features, and carefully formulate a non-linear optimization to optimize the compactness of the ellipsoids. To ensure the success of the optimization, we also propose to use anisotropic remeshing to obtain feature-adaptive meshes to better initialize the optimization. The left museum roof is original mesh. The middle one is the mesh after anisotropic remeshing. The right one is model with packed ellipsoids. 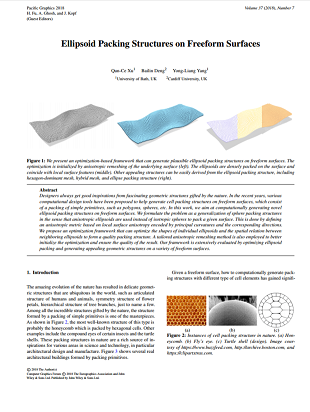 A gallery of 3D ellipsoid packing and derived structures on different freeform surfaces. We test our framework on a variety of freeform surfaces with different geometry and topology. The results demonstrate the effectiveness of our framework for generating useful ellipsoid packing structures that are adaptive to surface features. We are grateful to the anonymous reviewers for their comments and suggestions. We thank Shi-Min Hu, Yu-Kun Lai, Peter Hall, and Christian Richardt for helpful discussions. The models used in the paper are courtesy of Caigui Jiang, Alexander Schiftner, and Johannes Wallner. The work was supported by CAMERA, the RCUK Centre for the Analysis of Motion, Entertainment Research and Applications, EP/M023281/1.